Persisting human rights violations against people seeking protection at Bulgaria’s border with Turkey have been confirmed following a recent visit of the European Parliament Committee on Civil Liberties, Justice and Home Affairs (LIBE). At the Greek border with Turkey push backs remain the norm. The delegation was gathering first-hand information and despite conflicting information from Bulgarian authorities and civil society organisations the visit confirmed push backs at the Bulgarian border with Turkey : “From the way the [Bulgarian authorities] answered to many of our questions, the least we can say is that we can have our doubts. When they tell us: “we alert the Turkish border guards”, this is tantamount to push-backs, made by the Turkish authorities, following a gentle notification from the Bulgarian authorities. These people are simply prevented from claiming for asylum at the border, and maybe among them are Turkish citizens”, said Marie-Christine Vergiat, Confederal Group of the European United Left – Nordic Green Left, leading the mission. According to the AIDA Country Report Bulgaria, the number of apprehensions for irregular entry has drastically dropped in 2017 as a result of push backs and excessive use of force by border guards. 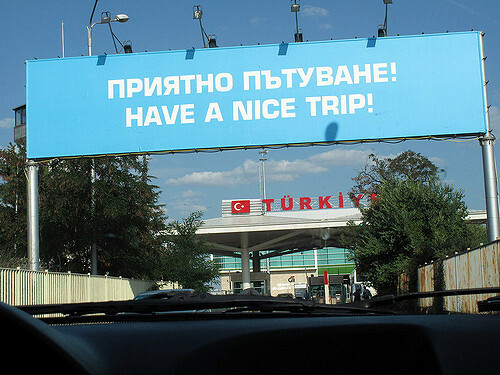 Nevertheless, some persons are still able to enter the country through the border fence with Turkey, while corruption among Bulgarian border control authorities has been acknowledged by the government. The European Parliament found the involvement of Frontex to make positive contributions to avoiding abuses in border control in Bulgaria, a finding shared by civil society organisations. Similar problems persist in Greece, where a standard practice of push backs on the land border with Turkey seems to have increased in 2017, attracting reaction inter alia from the Greek Ombudsman and the Council of Europe Commissioner for Human Rights. The Greek Council for Refugees has released several testimonies of asylum seekers, including families, pregnant women and survivors of torture, referring to violence and arbitrary detention under squalid conditions suffered at the hands of the Greek authorities before being transported in vans and being placed in overcrowded dinghies on the Evros river. The cases reveal a standard pattern in the conduct of the Greek authorities: persons entering the country are arrested and transported (often) in police vehicles to places of detention guarded by officials dressed in police or army attire, or even dressed in black with their faces covered. People’s belongings are seized while in detention. After a period ranging from a couple of hours to a few days, they are transported to the Evros river and handed over to armed officials who place them on dinghies and direct them to Turkey. Asylum seekers report abuse and use of force throughout the entire process.